Very effective for hot flashes. These last anywhere between 2 to 30 minutes. The hot flash results from altered thermal stability, which is maintained by the hypothalamus (a brain region located above the pituitary gland on the brain's floor). This organ controls the body's temperature regulation. Estrogen levels can affect some functions of the hypothalamus. During menopause, the ovaries produce less estrogen. Sensing this, the hypothalamus responds by rapidly changing body temperature. The result may be a hot flash. Some people get only 2 episodes in a week while others suffer multiple episodes in the same day. Some women go from feeling hot to feeling cold. The hot flash may begin with a sudden tingling in the fingers, toes, cheeks, or ears. Severe hot flashes occurring the night time, called 'night-sweats', can lead to severe sleep deprivation. Severe hot flashes can cause 'rosacea' (flushing and redness) on the central face and across the cheeks, nose, or forehead. As estrogen is typically lowest at night, a woman might get night sweats without having any hot flashes during the daytime. How long will these hot flashes last? Nearly 85% of perimenopausal women suffer from hot flashes. 25% of these may keep having them up to 10 years after menopause. Do men have hot flashes? Normal aging can cause the condition in a few men. Men receiving testosterone suppression treatment or castration for prostatic carcinoma are known to suffer hot flashes. Alcohol is another proven factor that can cause this condition in many men. Alcohol, coffee, caffeinated beverages, chocolates, very hot or spicy foods etc. are established triggers for hot flashes. Try to avoid these. Identify the triggers in your case. Have more of foods that alleviate the condition. Soya milk, whole soya beans, tofu, tempeh, black cohosh. Osteoporosis is another condition aggravated by menopause. Have foods rich in calcium and vitamin D, and talk to your physician before opting for supplemental calcium. Exercising regularly minimizes the effects of hot flashes. If you are going through menopause & do not exercise, then start now. You can walk, run, ride a bicycle, or do another activity. Just don't exercise within 3 hours of going to bed to help prevent night sweats. Regular session can also prevent other health conditions like osteoporosis, high blood pressures, stroke and diabetes. Wear only cotton clothes. Since, hot flashes are worse in summers, try wearing clothes in layers. This makes it easier to shed them in case of a sudden attack. Generally, if your symptoms are mild, no treatment is required. Medications are needed only when hot flashes disrupt your daily life. Declining estrogen levels in blood is known to contribute to hot flashes. The conventional treatments emphasize on Hormone Replacement Therapy (HRT) as the first line of treatment. It is advisable to start with the lowest dose which alleviates the symptoms and to increase the dosage gradually, based on symptom response. However, HRT is associated with many side-effects, like breast cancer, stroke, and dementia, making their long-term benefits very doubtful. Gabapentine, to an extend, alleviates hot flashes in castrated men, or those being treated for prostate carcinoma. Other alternatives to decrease the intensity & frequency of hot flashes are changes in diet and living. Being a hormonal disorder connected with body's own thermal regulatory mechanism, homeopathy has a great role to play. We have treated a number of cases where patients have reported significant to complete recovery from Hot flashes. 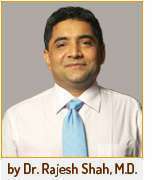 The medicines are selected on the basis of individual case details and are very effective. Homeopathic treatment for Hot flashes is strongly recommended. 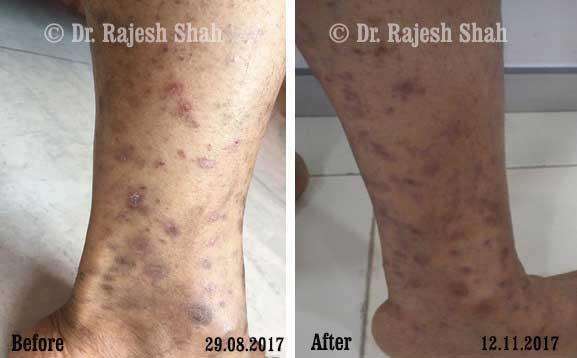 A case of chronic Psoriasis showed remarkable recovery with regular homeopathic treatment.